Rank and organization: Hospital Corpsman, U.S. Navy, attached as a medical corpsman to 1st Marine Division. Place and date: Korea, 26-27 March 1953. Entered service at: Alexandria, Va. Birth: Alexandria, Va. Citation: For conspicuous gallantry and intrepidity at the risk of his life above and beyond the call of duty as a HC serving with the 1st Marine Division in action against enemy aggressor forces on the night of 26-27 March 1953. After reaching an intermediate objective during a counterattack against a heavily entrenched and numerically superior hostile force occupying ground on a bitterly contested outpost far in advance of the main line of resistance, HC Hammond’s platoon was subjected to a murderous barrage of hostile mortar and artillery fire, followed by a vicious assault by onrushing enemy troops. Resolutely advancing through the veritable curtain of fire to aid his stricken comrades, HC Hammond moved among the stalwart garrison of marines and, although critically wounded himself, valiantly continued to administer aid to the other wounded throughout an exhausting 4-hour period. When the unit was ordered to withdraw, he skillfully directed the evacuation of casualties and remained in the fire-swept area to assist the corpsmen of the relieving unit until he was struck by a round of enemy mortar fire and fell, mortally wounded. By his exceptional fortitude, inspiring initiative and self-sacrificing efforts, HC Hammond undoubtedly saved the lives of many marines. His great personal valor in the face of overwhelming odds enhances and sustains the finest traditions of the U.S. Naval Service. He gallantly gave his life for his country. 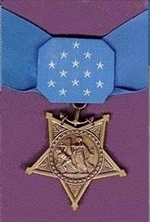 Medal of Honor Citation: Lester Hammond, Jr.